1. Grind tomato, jeera, peppercorns, curry leaves, garlic, red chilles to fine paste. 2. Dilute the mixture with dhal water and adjust the consistency. 3. Bring the mixture to boil once it comes to rolling boil, temper the rasam with red chilli and fenugreek. You can use ghee or oil for tempering. Close with the lid immediately. 5. Serve with hot rice, poriyal(koora), and chips or appalam. 1. If tomato is not sour add tbsp of tamarind extract. 2. Cook tuvar dhal in pressure cooker reserve the water for making rasam or use 1/8 cup of cooked tuvar dhal dilute with water and use if for making rasam. 3. You can even use normal water instead of dhal water, it tastes slightly different but still it tastes good. seeing all the foodblogs, i wish i was a guy and would have had a lovely cooking wife! !jus kidding!! Sounds so yummy! ANd easy! tomato ...charu ..very intersting ...my fav!!! :)Yuummmyyy!!! will u bel;ieve? I make it the exact same way..its sucha soothing taste. Rasam is real comfort food. I make thakkali rasam slightly different than yours, but this simple rasam looks like a beauty pageant with your beautiful decoration. You are really very innovative to use even the spices to decorate the dish. Should learn from you. Rasam sounds yumm and its a cute platting. Very pretty decoration of the dish, and the rasam looks delicious. Tomato Rasam is always a comfort food when not feeling well or any winter evening. Ur posts are always yummy. I love Rasam, its so soothing...by the way have taken any class for dish decorating..everytime its so unique..I just love it.. I make 3-4 types of tomato rasam's...my comfort food for rice with some fry...urs look good too.. 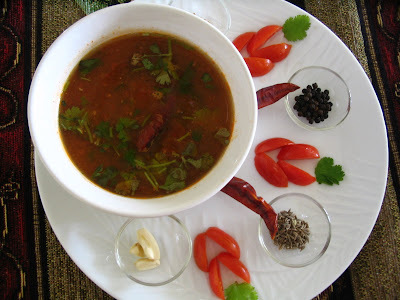 I do love this tomato rasam...looks yummm!! Looks yummy,I love tomato rasam! U have lots of patience to present the dish every time decorated!! 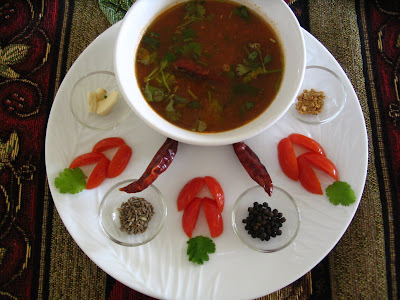 I too make rasam when I am too tired, its such a comfort dish, i really adore your presentation, you are very creative girl!!! this is one of our favourites...the best part is it is so easy to make! wow so beautiful presentation and chaaru look so perfect nice and comfort food. Yummy rasam and a wonderful appealing presentation! 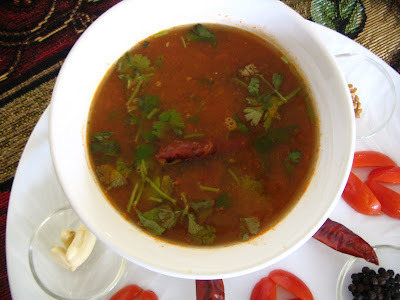 I love the tangy taste of tomato rasam too and that meal sounds so comforting. As usual, love pictures. Interesting decor!! Rasam looks great. 100th post, congrats on your hard work...have a great blogging years to come!! Rasam is the best I can have when am sick and tired of all food. Tomato rasam looks lovely dear..
A rasam and a curry is more than enough to quench my burning hunger anytime. Looks perfect and delicious! So comforting to have with rice.You know what? I too made rasam yesterday! I love your version. Lovely dish with hot rice.Nice presentation.Yummy rasam. Thanks all of you for your lovely comment.